Yesterday in Chicago, as part of a season-long commemoration of Wrigley Field's 100th birthday, the Brewers donned "1937-inpired" uniforms, giving baseball fans another window into Milwaukee's baseball history. 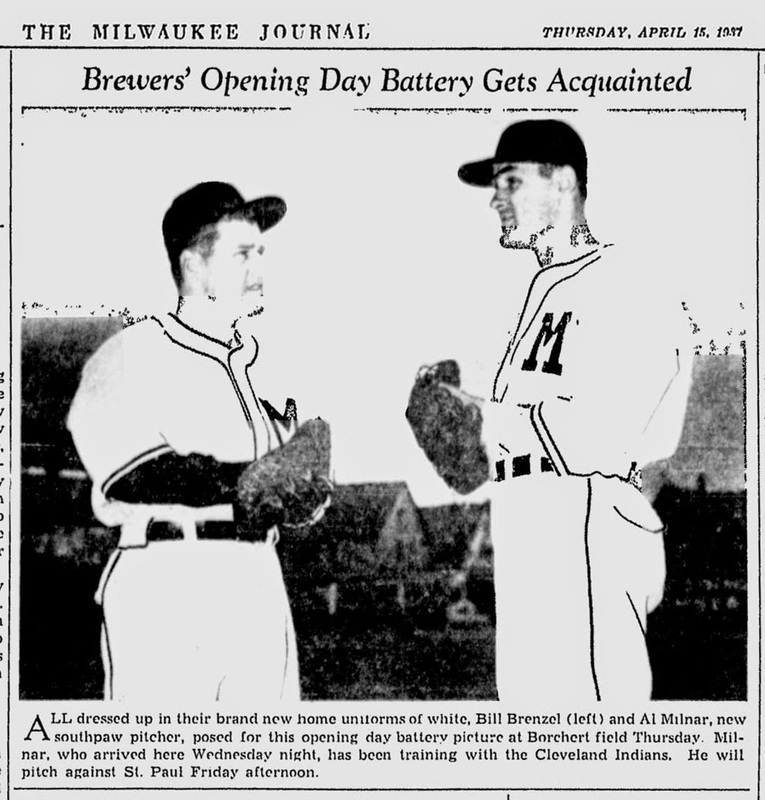 We didn't know until a few minutes before the start of the game what the Brewers were going to wear; it turned out to be more 1936 than 1937, with one element from even farther back in the club's history. 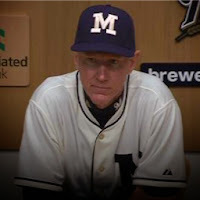 Navy cap, cream-colored block "M" logo on the front. The logo is distinctive with its "sword-tip" notch on the top, something the American Association Brewers dropped after the 1913 season. The Brewers had intended to pair their 1913 throwback jerseys with white caps, but the caps supplied by New Era were too white and clashed with Majestic's cream-colored jerseys. The white caps were pulled at the last minute and replaced with navy caps with cream logo. That meant that New Era only had time to supply enough for the players themselves, and the navy version never made it as far as retail. Perhaps this is an attempt to finally cash in and recoup something on the design; I fully expect to see these caps for sale soon. 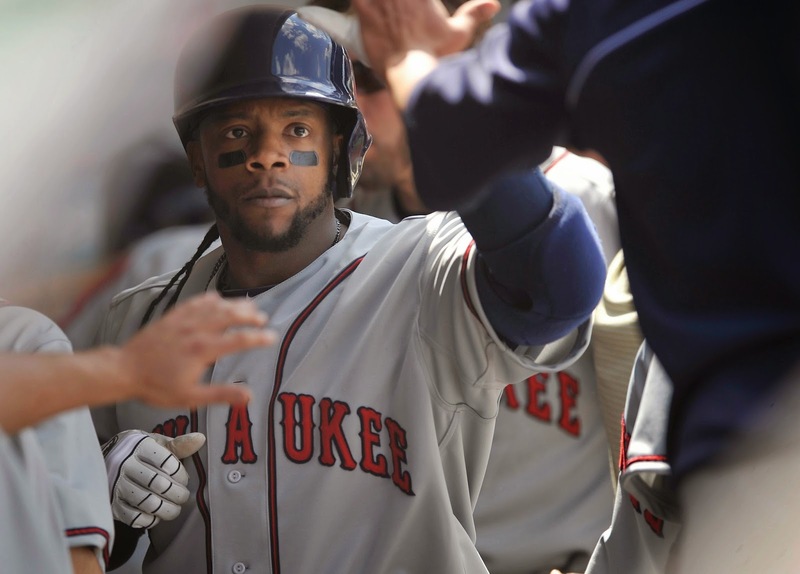 At bat, the Brewers kept their standard navy helmets but removed their contemporary logo. That would have been appropriate for either the 1913 or 1937 clubs, as each wore plain navy blue caps. Look at the custom work on Estrada's jersey, with the extra material added to each sleeve (and the rough edges where the piping was cut to accomodate it). You can also see how the squared-off placket piping was made. In the original uniforms I think these are supposed to be modeled after, the plaquet was slightly thinner, and the letters overlapped the piping, creating no such problem. 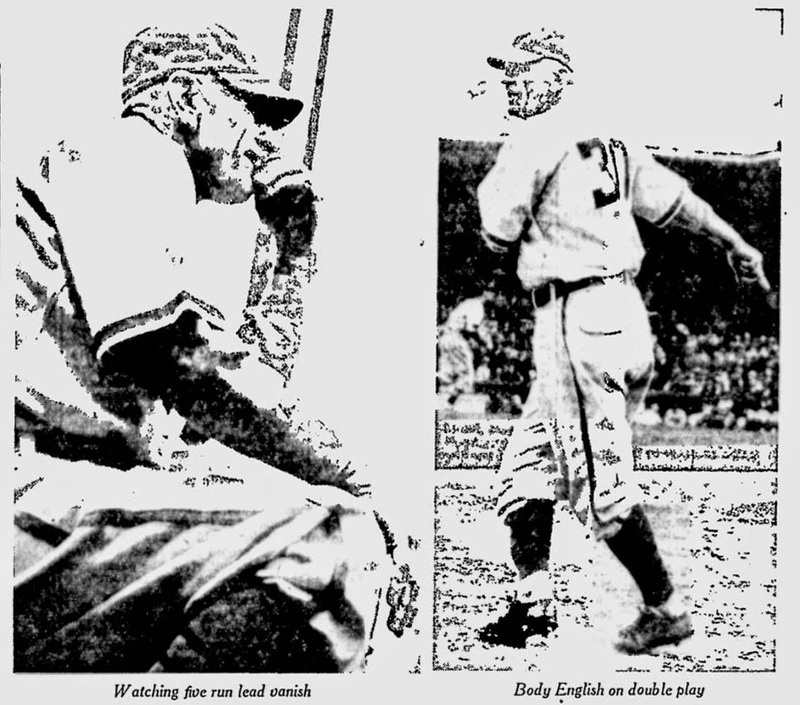 The photo at right is Brewer third baseman (and local Milwaukee boy) Ken Keltner, taken during Spring Training in 1937. 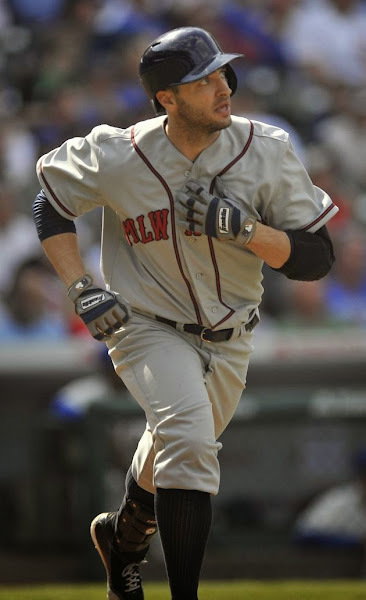 That is, I believe, the previous season's road uniform, as it was common in this period to issue new uniforms immediately before Opening Day, having played Spring Training and exhibition games in year-old uniforms. 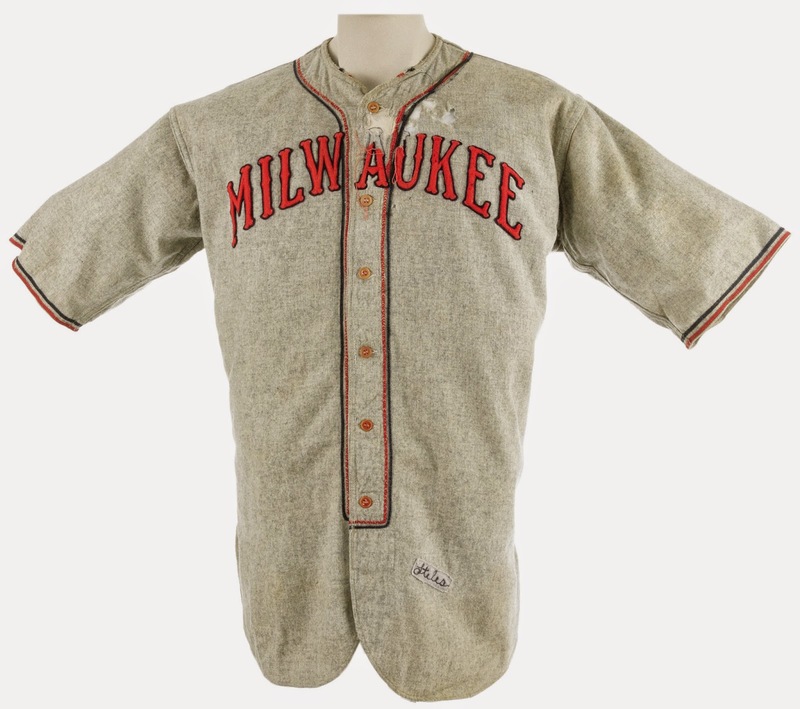 Compare it with this jersey worn by pitcher Rollie Stiles circa 1932-1934. Although slightly earlier, it uses the same lettering style with better spacing. They spaced the letters perfectly on the right side of the placket, only having a gap where the two halves of the jersey come together. 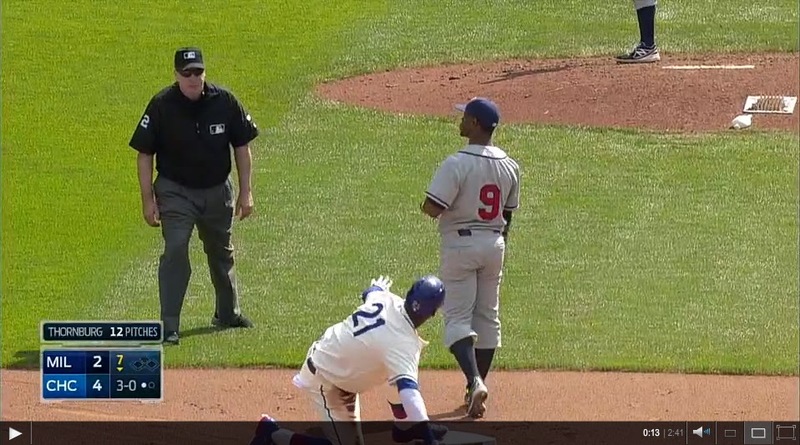 I suspect this gap issue was created by Ebbets Field Flannels, who have supplied lettering for these throwback jerseys in the past, and who sell a "1936" jersey with the same kerning problem. The gap might not be as pronounced as it was yesterday, but it's there. 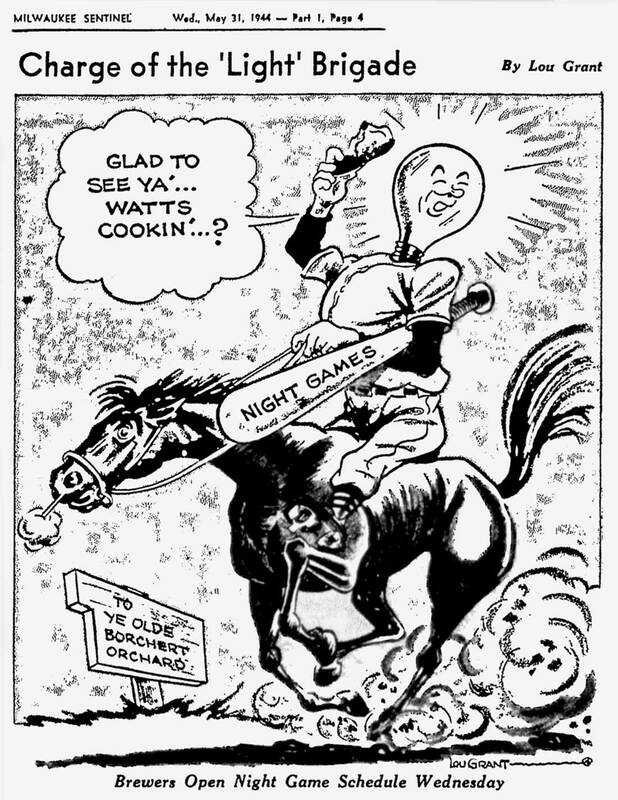 And it's something I've only seen on reproductions from Ebbets Field. Which raises the question: who manufactured these jerseys? 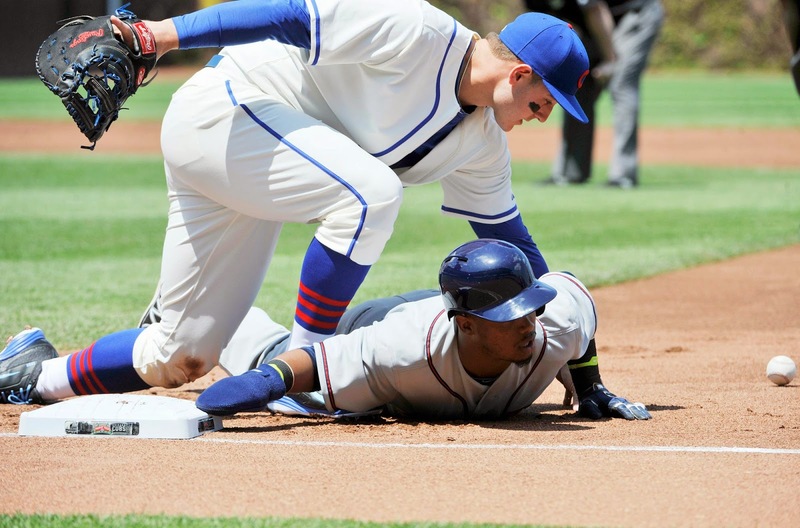 We know that Majestic, the big leagues' regular supplier, has right of first refusal when throwbacks come around. Last year Majestic supplied the 1913 and 1948 jerseys for the Brewers' two Turn Back the Clock events, but not this one. 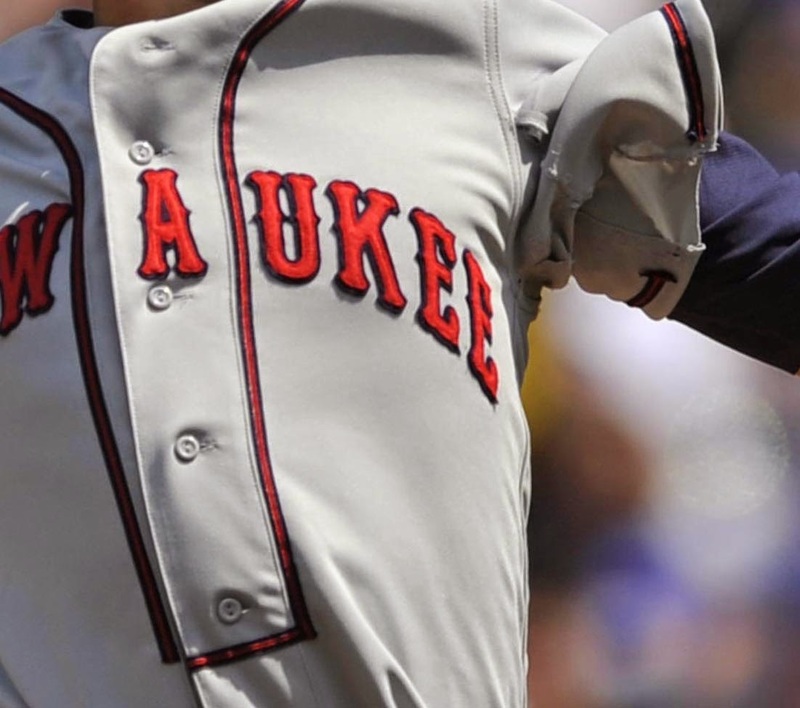 While the Majestic logo graced the sleeves of the Cubs' throwbacks, the Brewers' left sleeve was completely blank. Perhaps Ebbets Field did have a hand in these. We'll have to wait until game-used versions surface; unfortunately Majestic declining to make the on-field jerseys also means that MLB won't make them available for general sale. So we won't see a repeat of last season's retail Brew bonanza. The backs of the jerseys featured red numbers trimmed in navy. No names, of course, but the numbers (as is so often the case) were placed in their regular position leaving space for names, which made them far too low on players' backs. In the absence of a name, the numbers should have been higher. The Cubs' numbers are raised between the players' shoulder blades, as they should be. The Brewers' mystery manufacturer has put theirs too low. 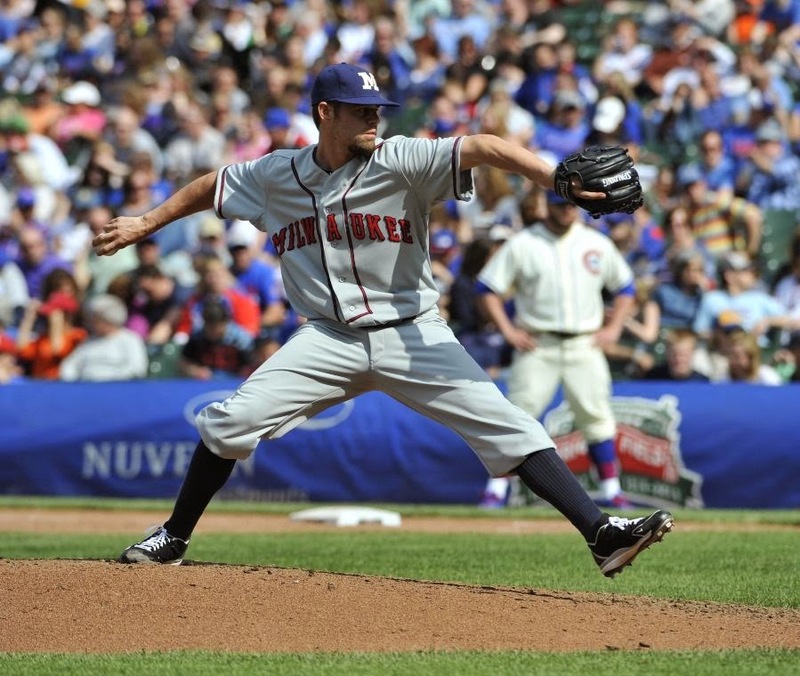 I also think it's a little odd that the Brewers wore plain gray pants with no piping. I'd be shocked if that decision had any historical basis at all. 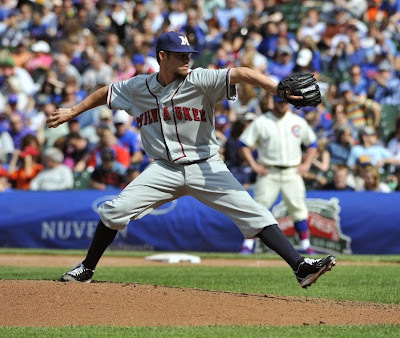 The Brewers' regular pants would have stood out, but surely a quick strip of that same navy/red/navy piping could have been sewn to the outseams. Even borrowing some Atlanta Braves pants, if not perfect with their extra belt loop trim, would have been closer to the mark. 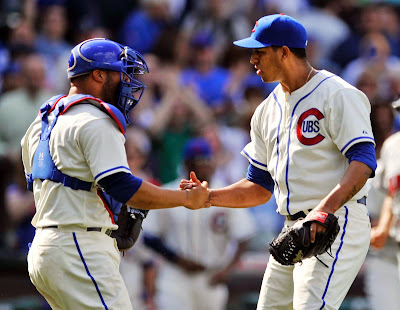 I'd never seen that oven-mitt-thing Segura is wearing on his left hand; turns out other players have been experimenting with the idea since at least last season to protect their fingers on the basepaths. 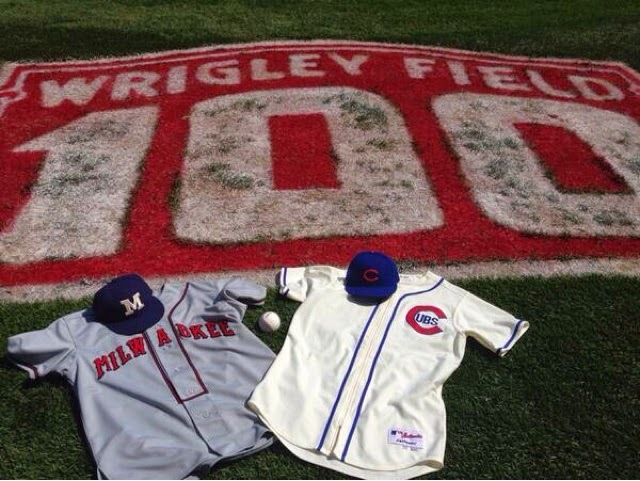 No retro logos on the bases, either; just the standard Wrigley Field Centennial dress. The Cubs, unfortunately, looked fantastic. I love their 1937 uniform, so clearly an upgrade from their regular look. 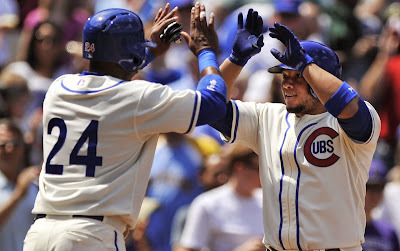 Chicago Cubs' Welington Castillo (right) celebrates with teammate Luis Valbuena after hitting a two-run homer. I love the brighter blue against cream and the thick piping. Simple and elegant. 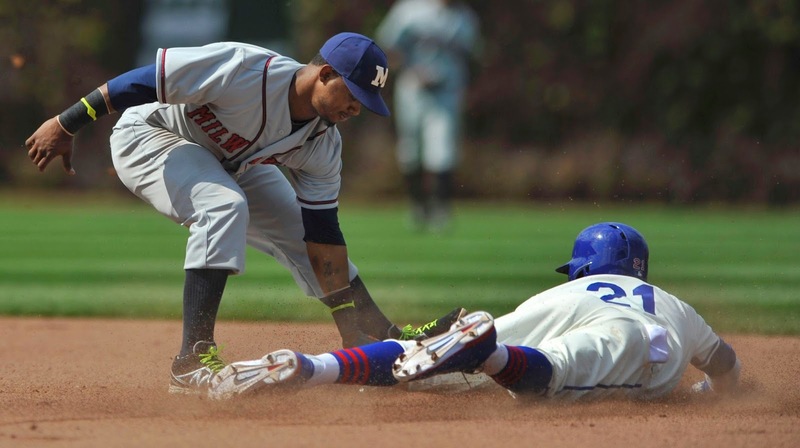 Puts the Brewers' drab regular navy uniforms to shame. So a bit of a disappointment yesterday. 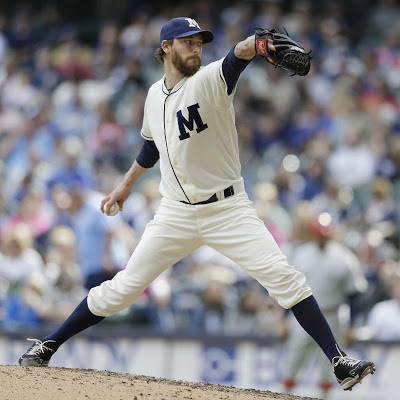 Not just in the 4-2 loss, or the Brewers' continuing offensive struggles, but the throwback uniforms themselves. After such a strong 2013, the lack of pants stripes, recycled cap and odd letter placement bother me. A bit muddled. Any opportunity to remember the American Association Brewers is a good one, but this wasn't their best effort. Since Turn Back the Clock uniforms are arranged by the home team, I'm happy to blame the Cubs for this one. Hopefully it's not the last one we see this year. 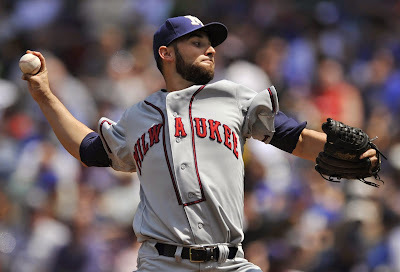 Just moments before the start of today's Brewers/Cubs game at Wrigley, we got our first good look at the throwbacks the Brewers will be using. 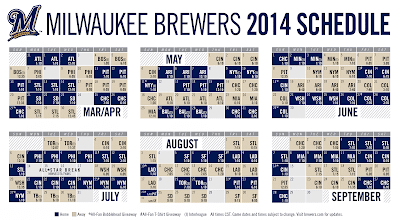 Interesting - that's the "1913" cap the Brewers wore last year. It came too late to be made available for sale, perhaps that will be different this year. The jerseys themselves look like the 1936 versions which have been commercially available for the past few years. ALL dressed up in their brand new home uniforms of white, Bill Brenzel (left) and AL Milnar, new southpaw pitcher, posed for this opening day battery picture at Borchert field Thursday. Milnar, who arrived here Wednesday night, has been training with the Cleveland Indians. He will pitch against St. Paul Friday afternoon. We've seen this jersey before, solid white with what appears to be navy piping. That was, as the caption states, new for 1937; in their pennant-winning 1936 season they wore uniforms with red and blue trim. We'll see what Major League Baseball has to say about the 1937 Brews this weekend. 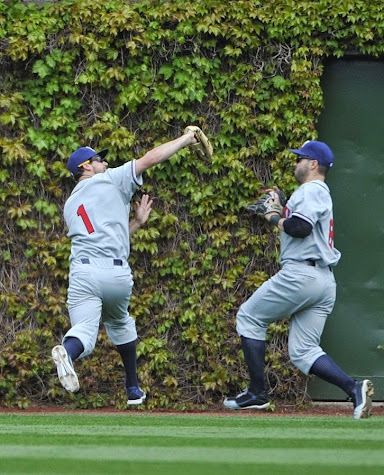 The Chicago Cubs have officially announced what we've suspected for months (and which I first heard rumblings about last November): the Milwaukee Brewers will indeed be wearing 1937 throwbacks for their Turn Back the Clock game at Wrigley Field this Sunday. 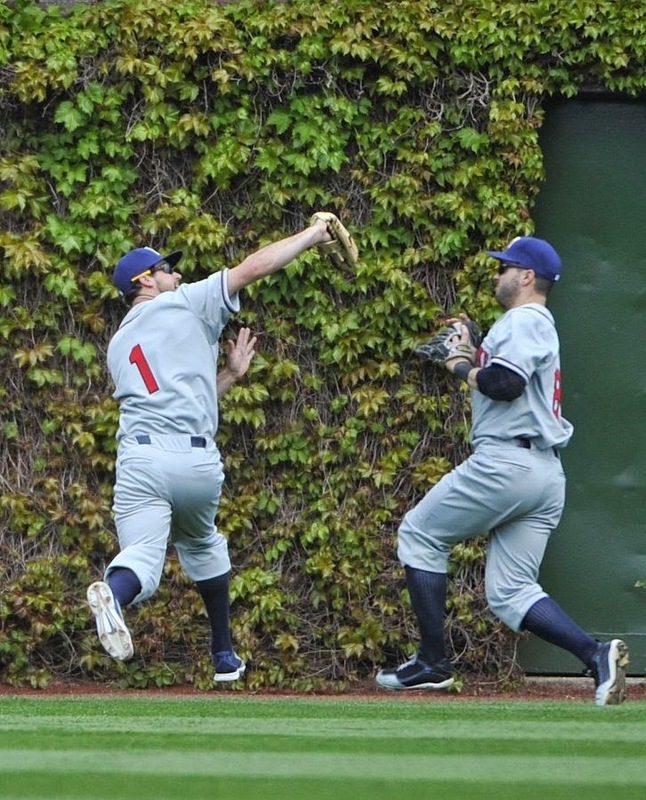 On Sunday, May 18, the Cubs will wear a throwback uniform from 1937, the year during which Wrigley Field's iconic scoreboard was installed and the ivy was planted on the newly-constructed bleacher wall. 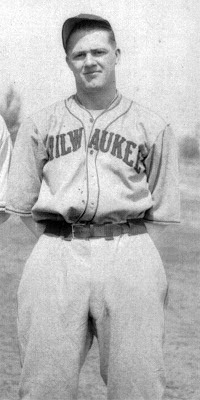 The 1937 jersey features a zip-up front and the uniform marks the first year the team switched from a navy blue to a royal blue color on its uniforms. Okay. That's confirmation. Maybe. No pictures yet, no details. If only we knew what "a 1937-inspired retro uniform" meant. Do they mean a modern cut, or do they mean that the uniform itself isn't really faithful to the Brewers' original 1937 togs? I laid out some possibles in my earlier post, but perhaps they're doing something entirely different, like the "1920s-ish but not actually what the Brewers wore in the 1920s" throwbacks from 1993. On this day seventy years ago, new Brewer manager Casey Stengel put on his uniform, stepped into the Borchert Field dugout and managed his first game with the club. Games, actually, a double-header with the Toledo Mud Hens. And what games those were. In the opener, the Brewers presented their manager with an easy win, spotting the visiting Mud Hens two runs in the first inning. The Brews then countered with three in the bottom of the first and never looked back, scoring another at the bottom of the second and fifth and another three in the sixth. Toledo managed a face-saving run in their half of the ninth, but the game was even more lopsided than that 8-4 score would indicate. The second game looked to be a repeat of the first, as the Brewers plated five runs in the third inning. They then let the Mud Hens back into the game, surrendering four in the next inning and one more in each of the fifth and sixth. 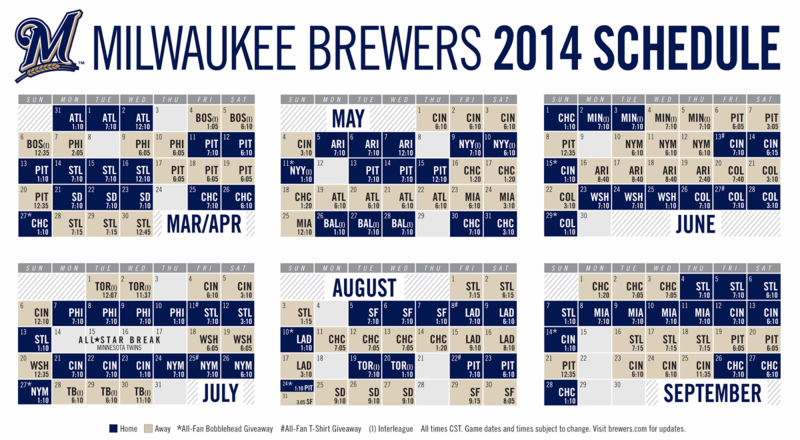 Down 6-5 in the bottom of the seventh, the Brewers tied it up and took that tie to the bottom of the ninth. And then the Brewers' championship spirit shone through. Centerfielder Hershel Martin came to the plate with two out and the bases empty. He singled, and moved to third on second baseman Tommy Nelson's double. 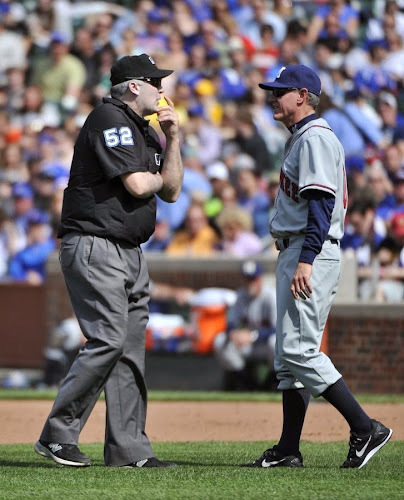 Jim Pruett, Brewer catcher, came to the plate next. He was intentionally walked to get to the pitcher, Jack Farmer. 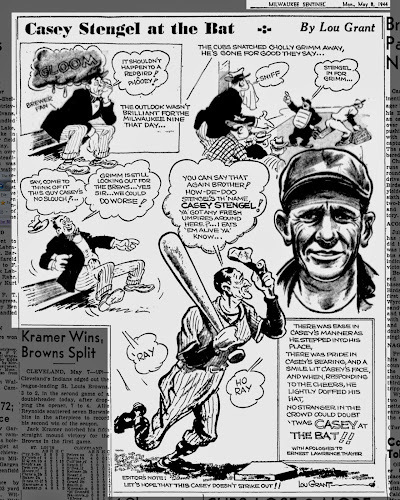 That let Casey Stengel get into the act. The new Brewer skipper sat his pitcher down in favor of pinch-hitter Frank Secory. With the bases loaded, Secory worked the count and forced a walk to bring the winning run home. 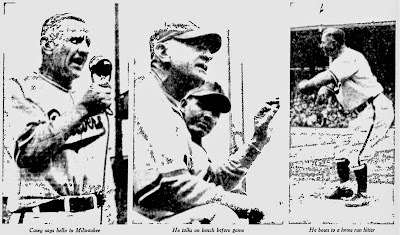 I wish we knew what Casey was saying, but none of the local papers recounted the text of his address to the Borchert Field crowd. That last one is interesting, with its view of the back of Casey's uniform. Number 30 had been previously worn by Charlie Grimm. Casey did more than step into his shoes; he put on Jolly Cholly's jersey, too. 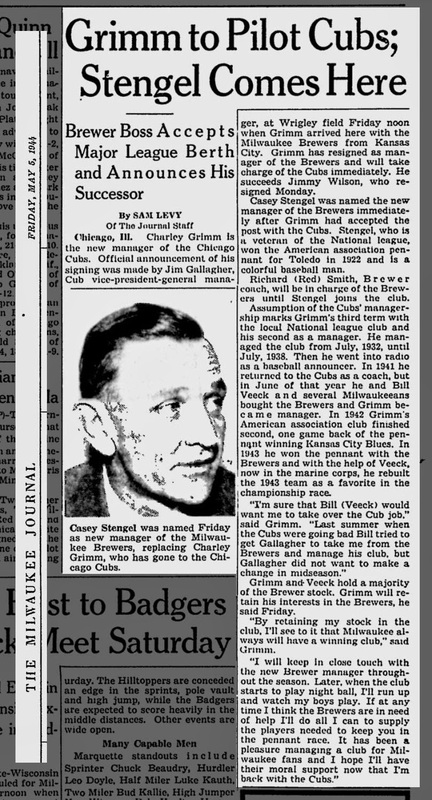 Before Charley Grimm left here Saturday night to take over the Chicago Cubs, he told Casey Stengel, his successor at the helm of the league leading Brewers: "You've got a smart bunch of fellows. Let them do their own thinking at bat. That's what I've done and it has been very successful." Late Sunday afternoon, after he had made an auspicious bow as Grimm's successor with a double triumph over Columbus, 8-4 and 7-6, to sweep the six-game series, Stengel remarked, "Grimm was right. This gang doesn't need any master minding on my part. They do right well on their own." 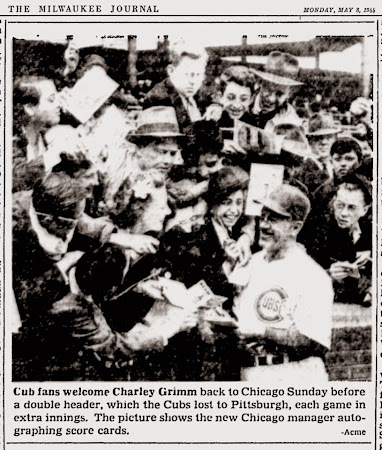 Meanwhile, in Chicago, Grimm began his own new job with a double-header of his own. The fans welcomed Grimm with open arms, the visiting Pittsburgh Pirates somewhat less so. Grimm watched his new charges fall in both games, 6-5 and 3-2 in extra innings (14 and 11, respectively). The losing streak that had cost the previous Cubs' manager his job was extended to twelve games. I wonder if there was any time during that Sunday afternoon when Charlie Grimm thought of the powerhouse ballclub he had left behind in Milwaukee? ...Well, kind of. The Brewer boss was still serving his country in the South Pacific, but the men he left behind were ensuring that he wasn't forgotten. 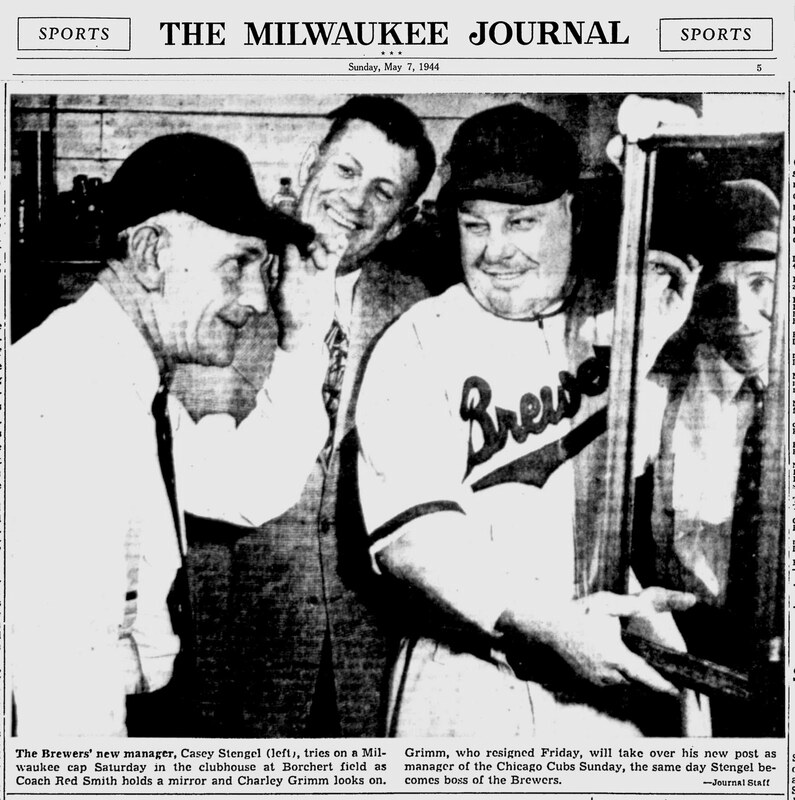 When the Brewers come home next Saturday, fans who go to the games at Borchert field will see President Bill Veeck as big as life. An enlarged photograph has been placed over the grandstand entrance. The picture shows Ed Kretlow, groundskeeper, putting it up before the team left last week, with General Manager Rudy Schaffer holding the ladder and Manager Charley Grimm supervising the job. 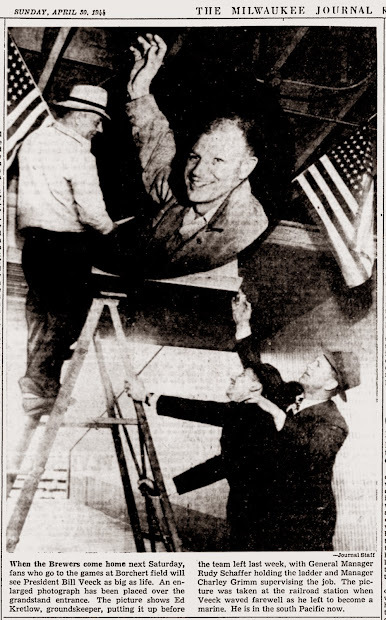 The picture was taken at the railroad station when Veeck waved farewelll as he left to become a marine. He is in the south Pacific now. I love this photo, not only for how the Brewers were remembering Veeck but also the rare glimpse at the interior of Borchert Field itself.